You must be a member of the Kuala Lumpur Creative Workshops Group to attend this activity. Would you like to join this group? 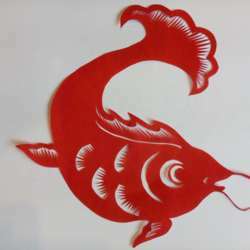 Let's learn the art of paper cutting for Chinese New Year and cut out prosperous fishes and beautiful lotus flowers! Chinese Paper Cutting is an ancient folk art that has existed since the 2nd century in China. With elegant motifs that symbolise good fortune and happiness, this art was inscribed on the Representative List of the Intangible Cultural Heritage of Humanity by UNESCO in Protected content . The pronunciation of fish in Chinese (鱼 yú) is homophonic with abundance (余 yú), hence it is an important symbol of Chinese New Year. Among these, the gold fish is the favourite. Likewise, lotus flower is another elegant symbol in the Chinese arts. Discover the reasons behind the paper cutting artwork, and bring home your artwork to decorate the home. Let's talk about it, cut the motifs and explore ideas of decorating with papercutting motives. This workshop needs at least 5 pax to make it happens. Please confirm your attendance with me via message or Whatsapp, I will send you a payment link to secure your seat. If we couldn't get 5 pax 3 days before the workshop, you will receive a full refund.